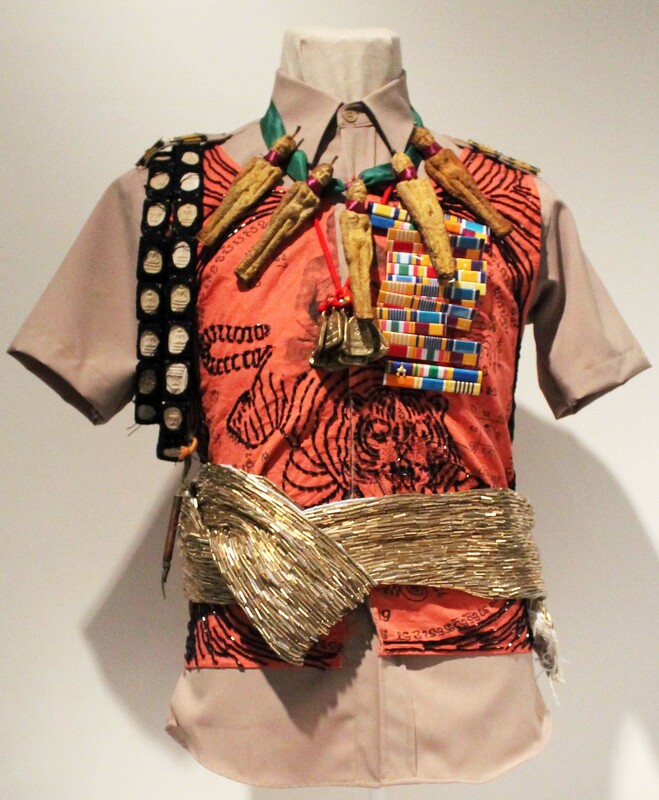 The exhibition is a meditation on the transience of worldly success and the way the trappings of social status are often imbued with quasi-mystical associations that maintain a link with animistic beliefs. 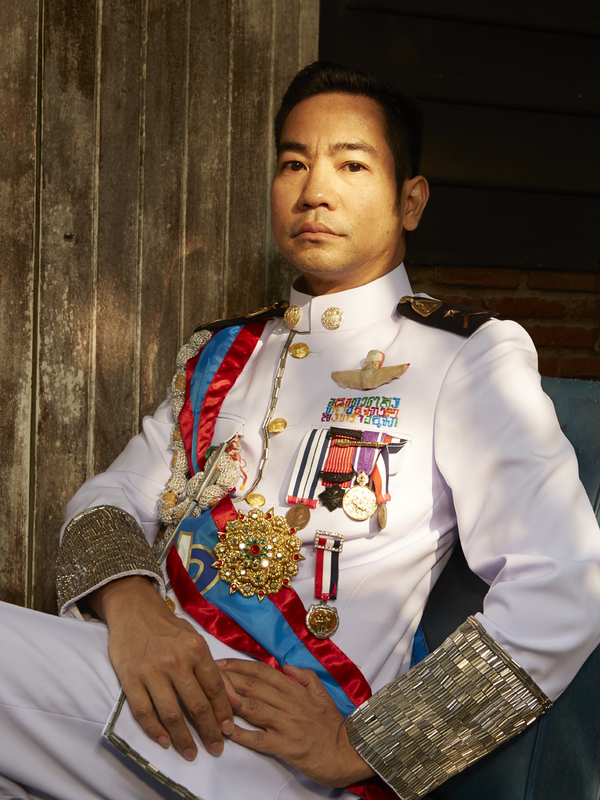 With the photographs, Jakkai adopts poses taken from portraits of his ancestors, many of whom served as royal courtiers and in some cases had their lives cut short by the sometimes tragic vicissitudes of Thai political history. 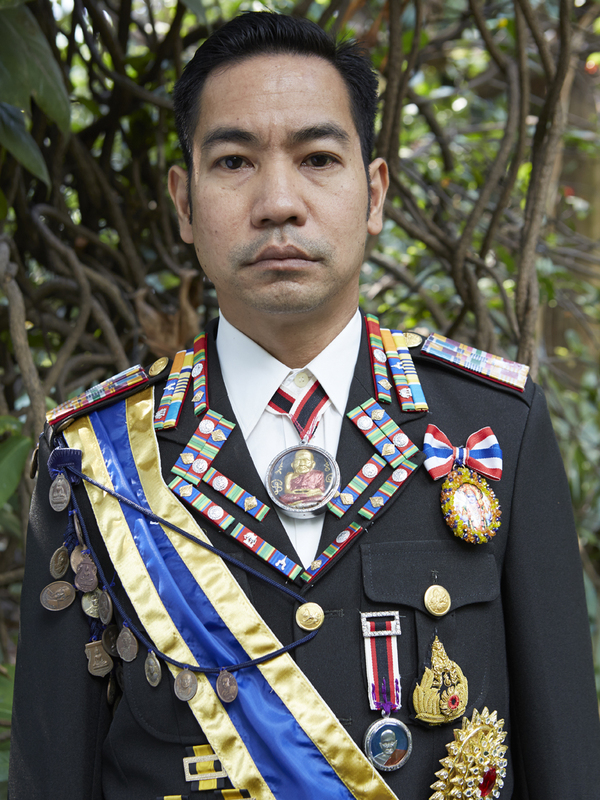 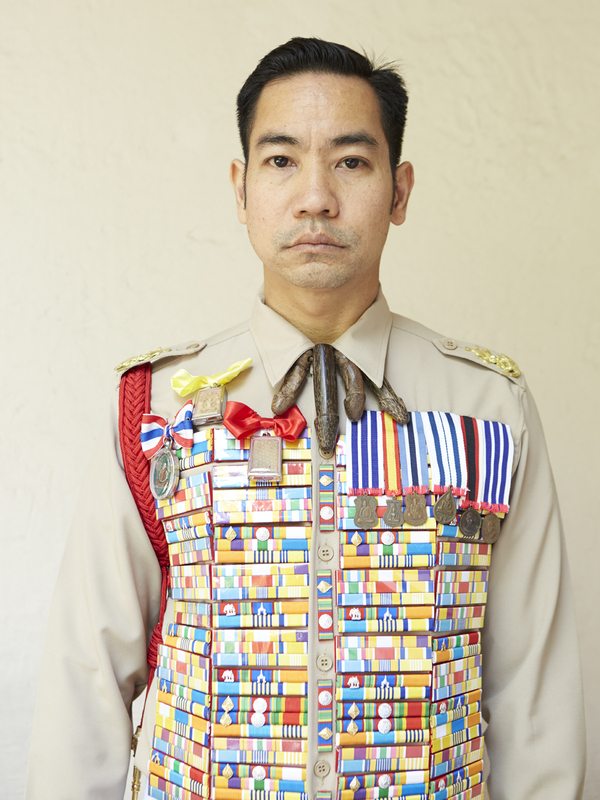 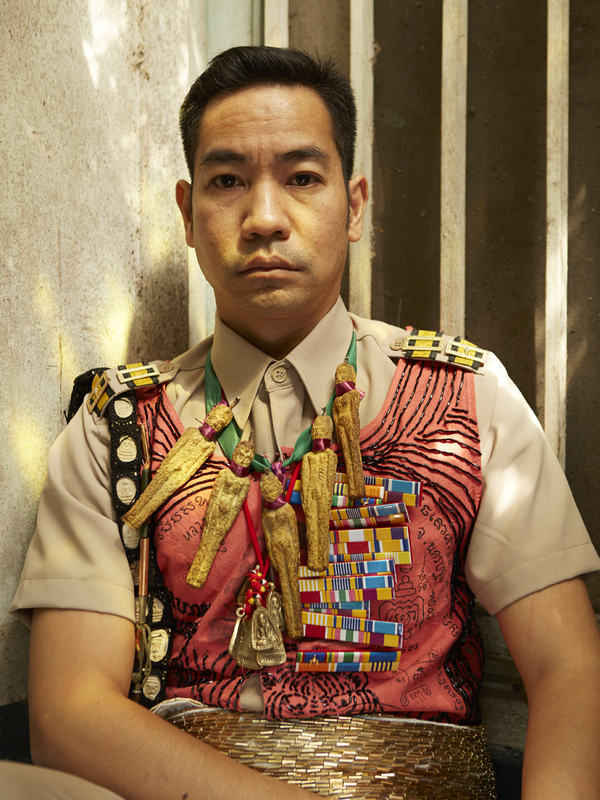 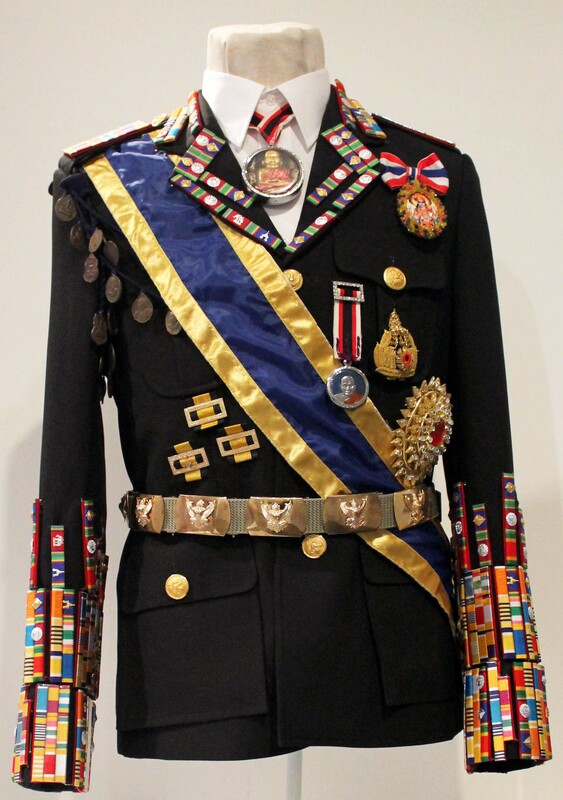 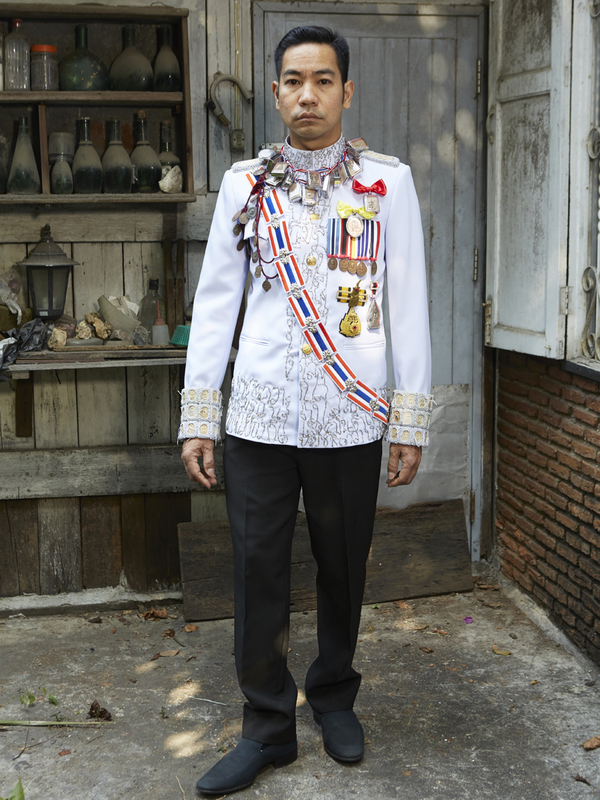 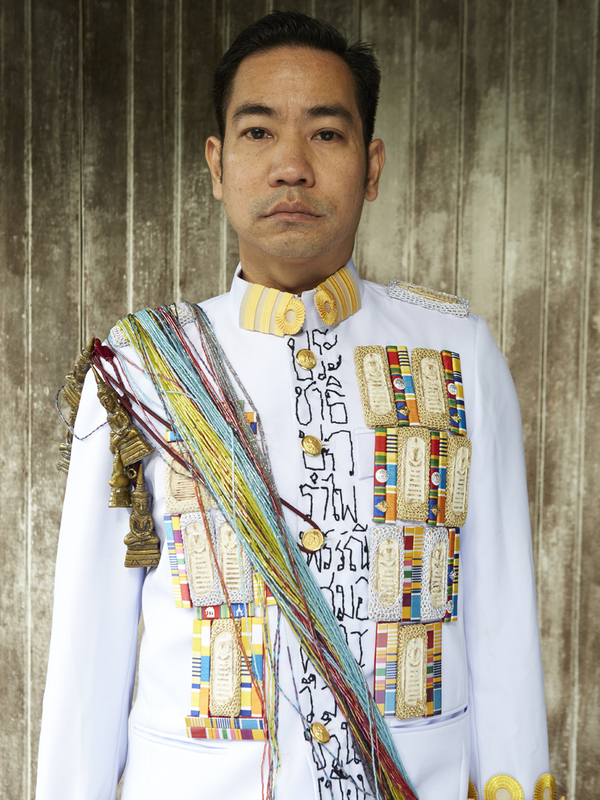 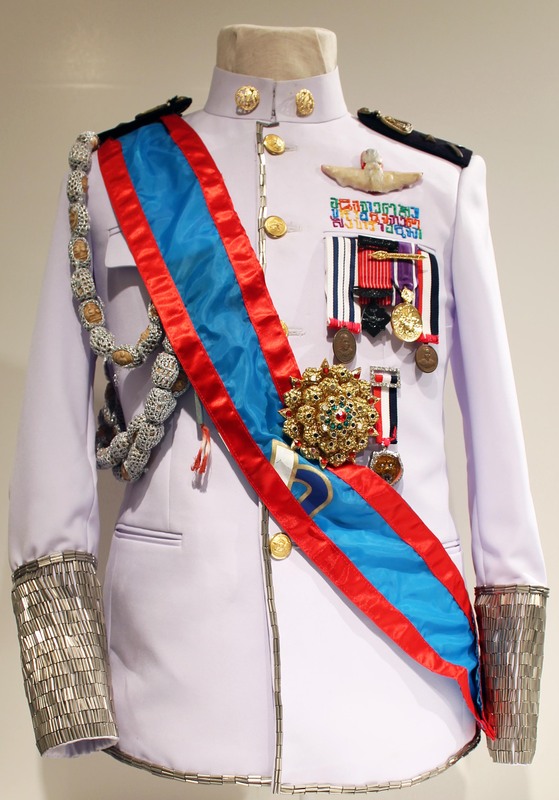 Wearing Thai civil service uniforms (ranked from C-11, the highest category, down to C-2) decked out with awards, he evokes the type of formal portrait photographs that are included in the funeral books that Thai families compile to commemorate the lives of relatives, and that typically emphasize the deceased person’s social status. 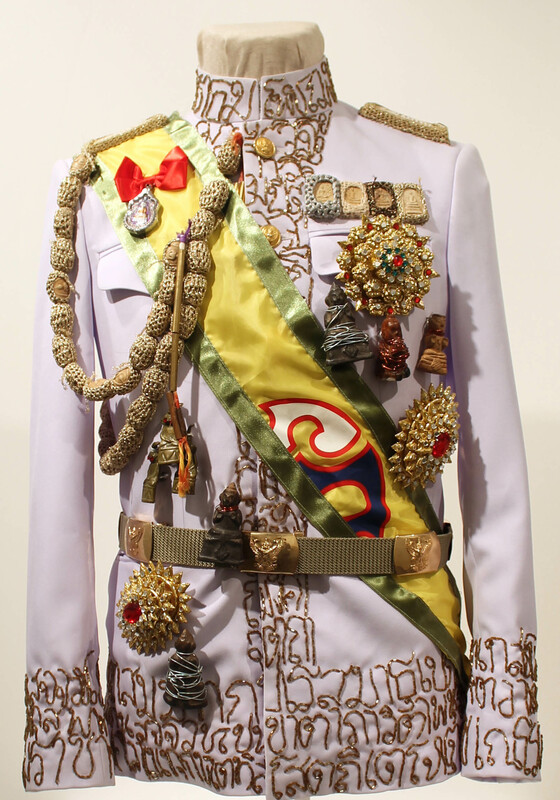 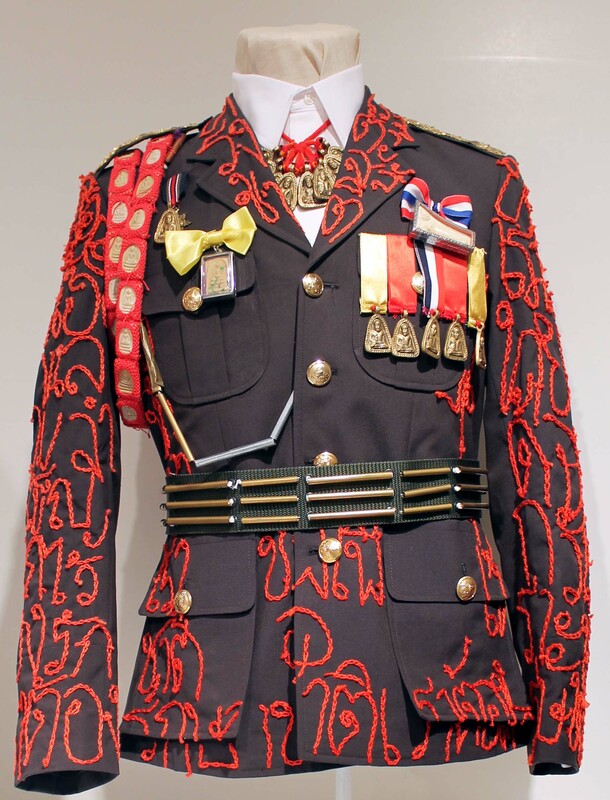 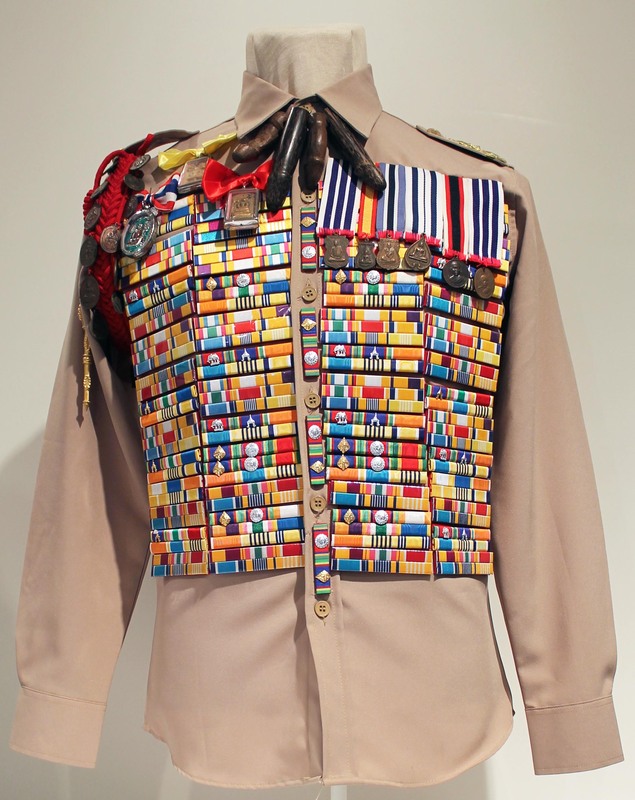 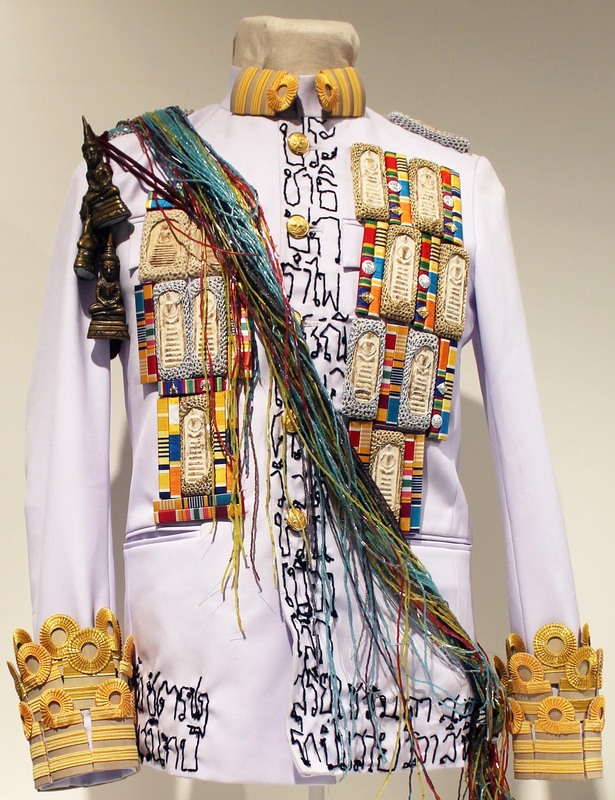 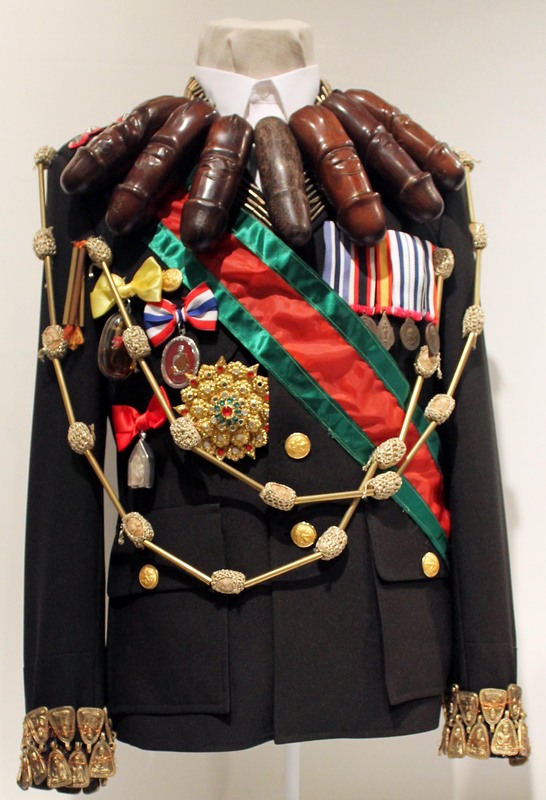 Jakkai has encrusted the actual uniforms with elaborate ornaments that are inspired by Buddhist amulets and animist talismans, hinting at the deep-seated beliefs that underlie current social conventions. 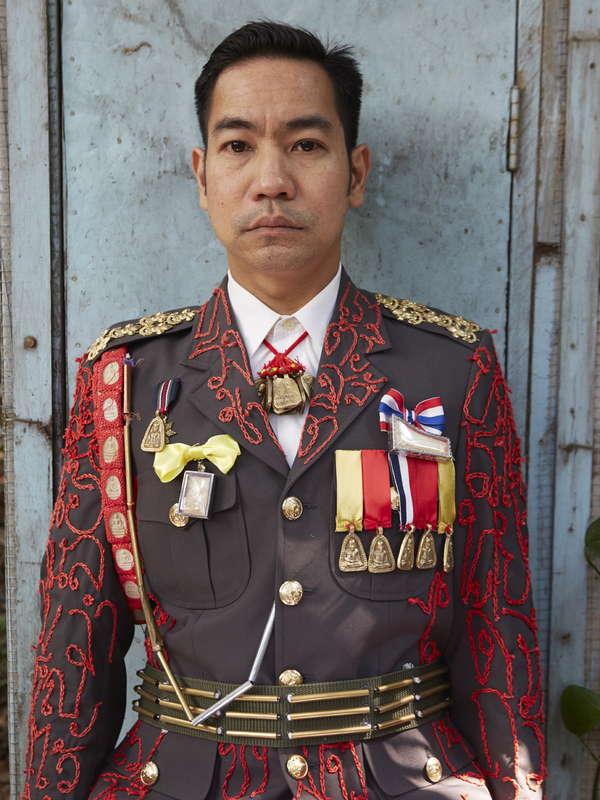 With some of the portraits, Jakkai poses in front of dilapidated backgrounds, pointing to the process of decay and rebirth that alludes to the cycle of life and death, as well as perhaps the state of social breakdown in today’s fractious Thailand. 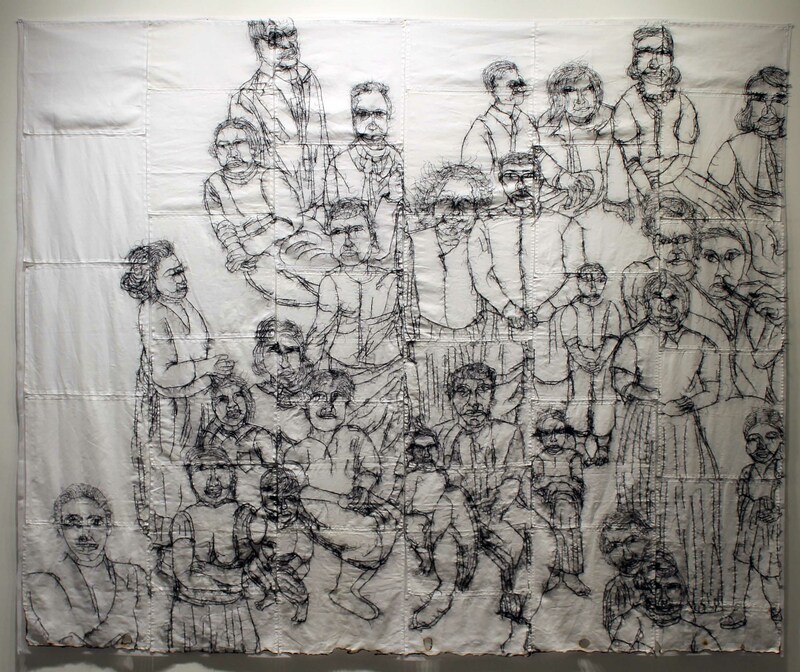 The exhibition title itself suggests that social status, like everything else in life, is but a transitory phase. 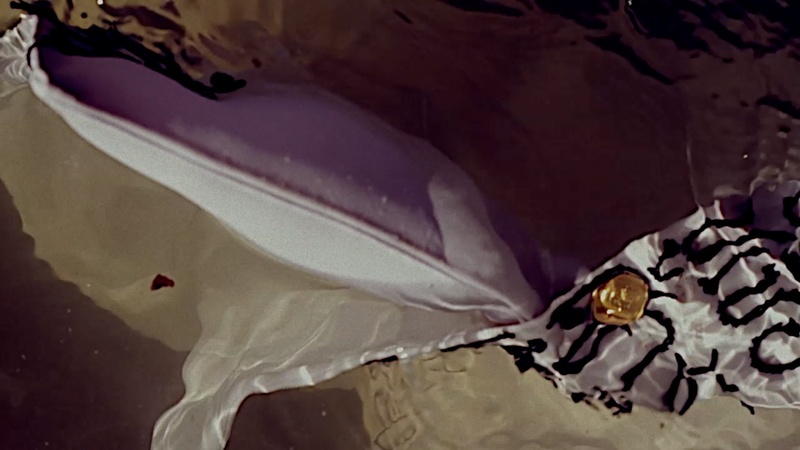 This sense is heighted by the short video work, in which a uniform jacket slowly moves under flowing water, accompanied by a soundtrack of a burning funeral pyre. 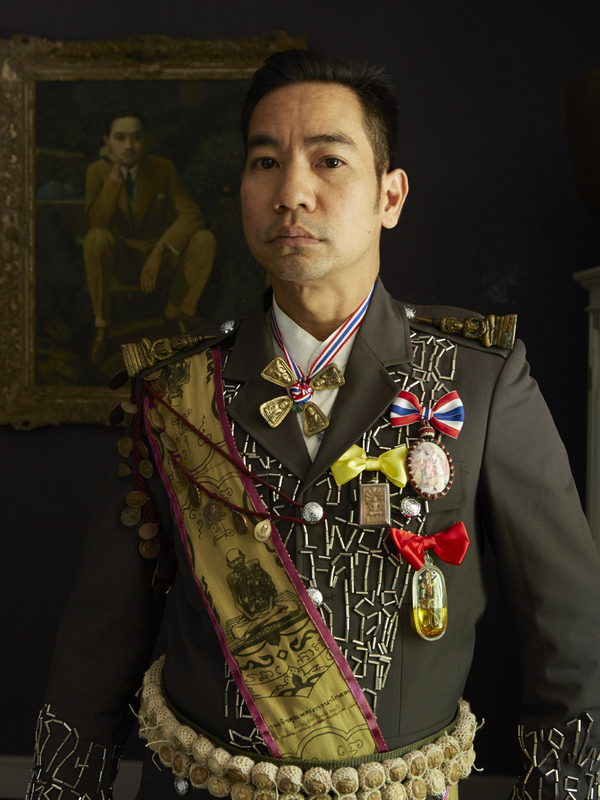 Jakkai’s work has been shown in a number of museums around the world in recent years. 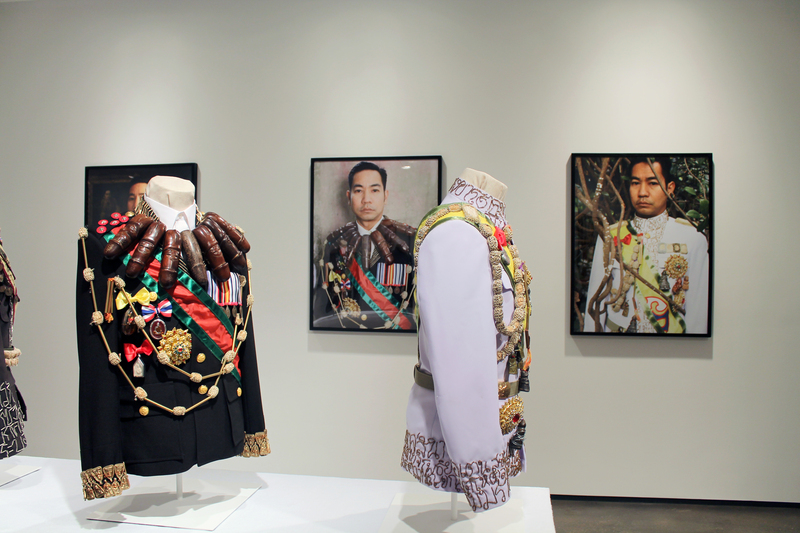 In the United States, his work was included in Phantoms of Asia: Contemporary Awakens the Past at the Asian Art Museum of San Francisco (2012), as well as the museum’s Here / Not Here: Buddha Presence in Eight Recent Works (2011). 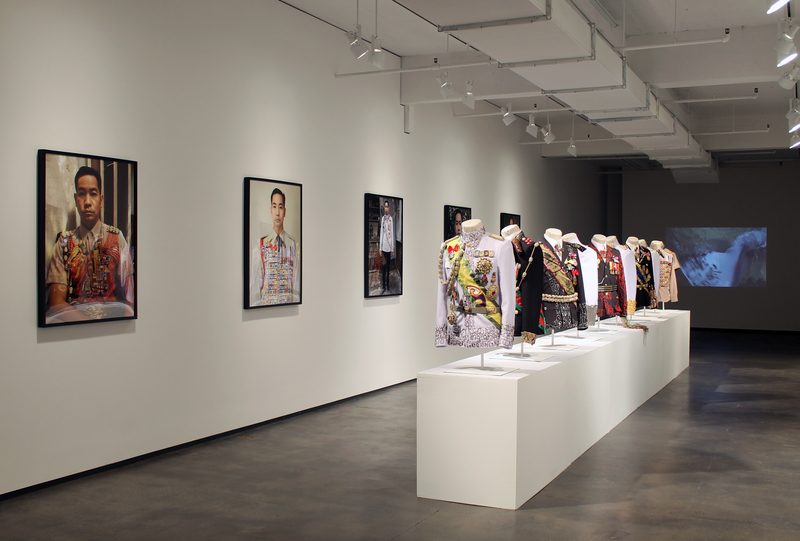 As part of the latter exhibition, Jakkai presented his interactive Reciprocity project in the Asian Art Museum’s Tateuchi Gallery; his work Recession (2010) subsequently entered the museum’s collection. 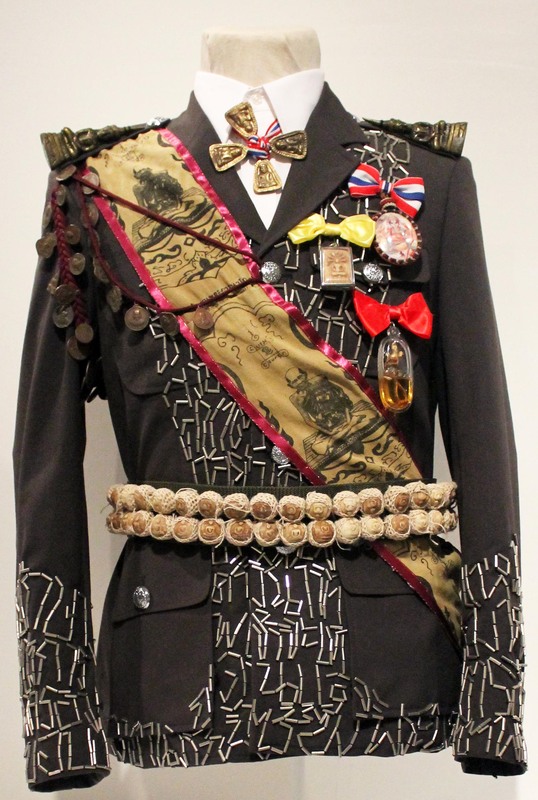 In 2009, Jakkai’s Lucky Ware installation (2008) was featured at the Rubin Museum in New York City, and he was included in Truly Truthful in Miami. 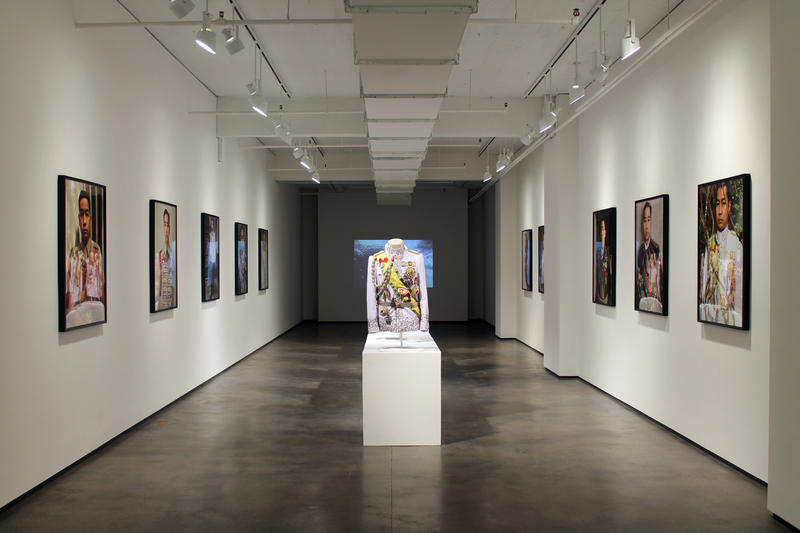 He has presented two solo exhibitions at Tyler Rollins Fine Art: Temple Fair (2008) and Karma Cash & Carry (2010). 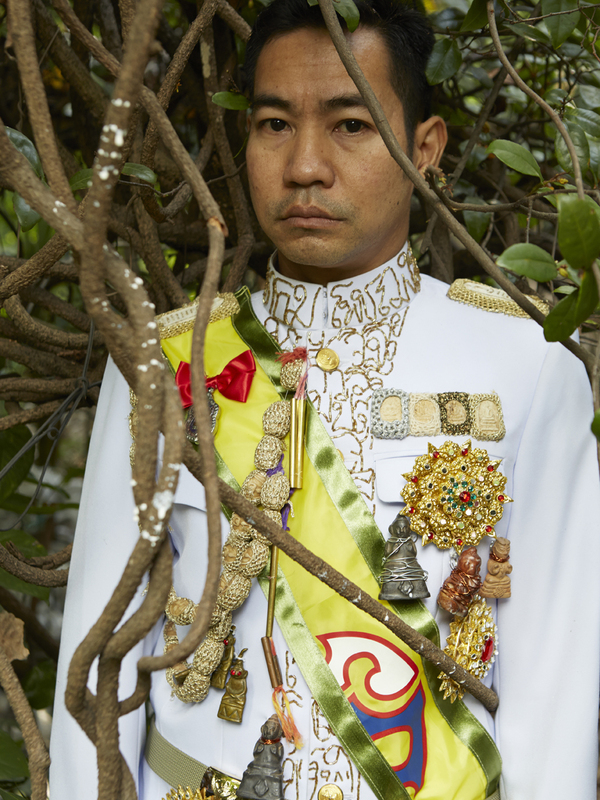 In Asia, Jakkai’s Shroud installation was recently featured in the exhibition, Exploring the Cosmos: The Stupa as a Buddhist Symbol (2012 – 2013) at Singapore’s Asian Civilisations Museum, which acquired the work for its permanent collection. 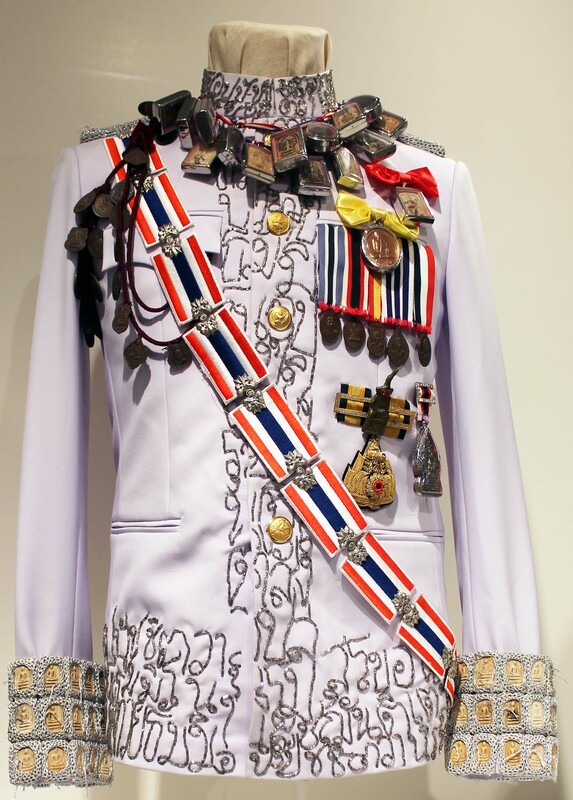 In 2011, he presented a major exhibition of installations, sculptural works, and embroidered tapestries at the Art Center, Chulalongkorn University, Bangkok, Thailand (2011). 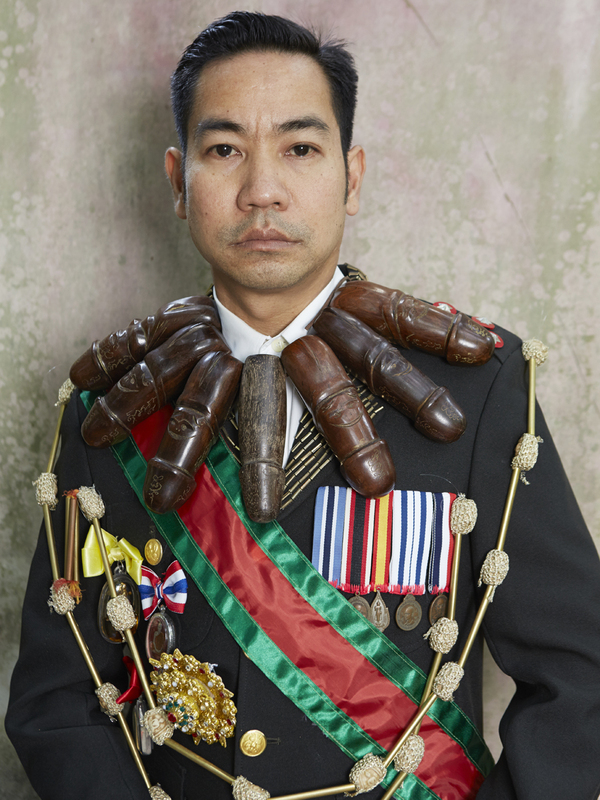 He was a featured artist in the 2011 Chongqing Biennial and in the 2009 Asian Art Biennial at the National Taiwan Museum of Fine Arts, which acquired his work, Suffrage (2008). 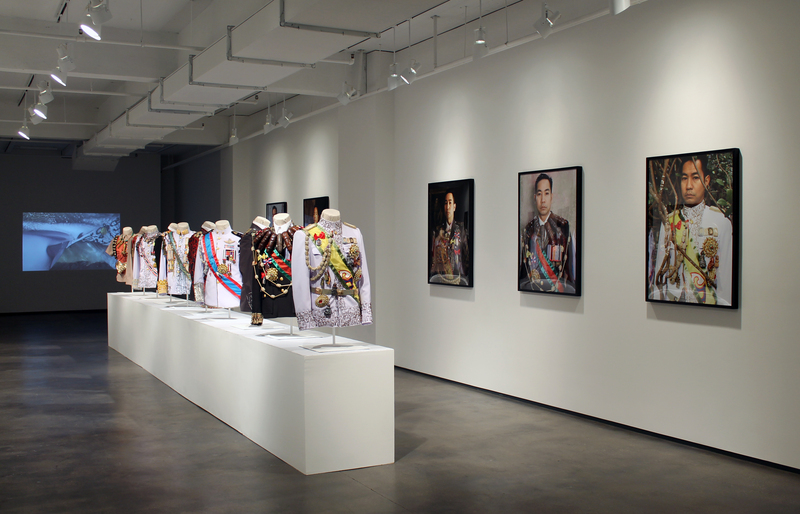 Other important collections of his work include the Bill and Melinda Gates Foundation, Seattle, and the Vehbi Koç Foundation, Istanbul.